The former defensive midfielder, Dalic, took over management of the team after Croatia suffered two defeats (to Iceland and Turkey) and a draw (to Finland) in the second round of their qualification campaign under Ante Cacic, which threatened their possible progression into the tournament. He led the team in a victory over Ukraine to secure their spot in the playoff round against Greece, who they defeated dominantly over two legs. Predicted Starting XI – I worked hard on creating checkerboard kits! In the four friendly games leading up to the tournament, Hoffenheim’s Kramaric played in the central forward position most often. The AC Milan striker Nikola Kalinic featured in the role less frequently, despite having 15 goals in 42 caps for the team overall. It is possible that we see him return to a starting position once the tournament begins. Mandzukic played one game on the wing (as he has been playing for Juventus) and one in the central forward position. Frankfurt’s Ante Rebic was most frequently played at right winger, but in my estimation, Mandzukic will take the starting position for the first game against Nigeria. Pjaca is another Juventus player who has featured at right winger, but less so than both Mandzukic and Rebic. The Inter winger Ivan Perisic takes the left winger position. Captain and Real Madrid star Luka Modric occupies the number ten role, while Barcelona’s Ivan Rakitic and Fiorentina’s Milan Badelj hold the two defensive midfielder positions. The Atletico Madrid defender Sime Vrsaljko is the clear choice for right fullback, while Liverpool’s Dejan Lovren and Lokomotiv Moscow’s Vedran Corluka occupy the central defender positions. The left fullback position has seen a lot of interchange leading up to the tournament, but since Lovren and Corluka have been playing together in the central defensive areas, Domagoj Vida of Besiktas has moved to the left wing and taken over the role from Ivan Strinic and Josip Pivaric. The 33-year-old Danijel Subasic of AS Monaco is the clear choice at goalkeeper for the team. Of those not already mentioned, on the bench, there is Tin Jedvaj from Bayer Leverkusen, Red Bull Salzburg’s Caleta-Car, Real Madrid’s Mateo Kovacic, Inter’s Marcelo Brozovic, and Rijeka’s Filip Bradaric. Kramaric is a technical center forward with good movement behind the defense who can also drop into central midfield to help circulation. His dribbling and shielding of the ball in tight spaces are clean while his ability to combine with midfielders running forward is another weapon. With him in the center forward role, Croatia have a quite complete striker for counter-attacks, connecting through the middle, and attacking crosses after the ball has been played wide. Perisic operates in an inside-winger role for the team. He can check deeper into central midfield if needed but prefers to remain between the opponent’s midfield and defensive lines. From this high position he can move into the halfspace to receive the ball and attack toward the goal diagonally, but he prefers most often to make runs outside toward the wing to get behind his opponent and cross or engage in a dribbling attack. His size and strength are above average for this position – but his pace is not very high. He can dribble past his opponent but will not leave them behind with his speed. Mandzukic is used in a right winger role for the team, which is comparable to his current position at Juventus or his role at Wolfsburg earlier in his career. He is most well known for playing as a target man center forward for Bayern Munich and Atletico Madrid. He is a very aggressive player who can run at a constant pace for nearly the entire match. His strength isn’t technical ability in tight spaces or speed in running, but rather his ability to attack or control high passes and bring his teammates into the attack with simple passes. He is continually moving along the opponent defensive line to try and get behind them or receive a high ball. He can make runs down the wing and attempt to get crosses into the box, but he prefers to move higher and inside like a second striker. He can act as a target for simple layoffs in the middle before the ball is played wide and he runs into the box to attack the cross with his strong headers. Luka Modric acts as a complete midfielder for the team. He is put in an attacking midfielder role to create for the group using his dribbling and passes behind the defense. He frequently drops out of the space between the lines to help stabilize the circulation in deeper zones and bring the ball forward to the strikers by dribbling past opponents, combining with the strikers, or playing passes into them. His positioning, scanning of his surroundings, body positioning, decision-making, and execution are all at an extremely high level. He is one of the best central midfielders in the history of football and is the clear gem in this Croatia squad. Rakitic performs as a deep-lying playmaker for this team. At Barcelona he is used more like a #8 who can run forward or fill the wing positions should Messi move toward the center. In this role, he frequently drops between the two central defenders or to the side of them to receive the ball with space and time. From this position, he will look to use his long passing ability to find his forwards or his fullbacks on the wings. He is capable of shielding the ball and dribbling in tight spaces, taking dangerous long shot opportunities, and playing long and accurate passes. Rarely, he will run forward and take part in the attack by combining with the forwards or dribbling through midfield to take a shot at goal. Badelj operates as a constant defensive midfielder. While Rakitic is more mobile, Badelj is strict in his position in front of the central defenders. He is capable of smaller movements to find passing lanes between himself and the deeper build-up players, receiving and passing under pressure with accuracy and cleanliness, and dribbling or shielding the ball in these situations as well. Defensively he is very stable and covers space in central midfield effectively. He looks to find a window from which to receive the ball and then play a faster low pass through the opponent midfield into the strikers to combine or play the ball wide for the fullbacks to run forward and cross. If Rakitic and Modric have both dropped very deep, he will occasionally move forward between the opposition midfield and defensive lines to keep the structure of the team, but outside of that, he will maintain his position in the center of the team. Vrsaljko acts as the technical and highly offensive fullback of the team. He will commonly occupy the right wing during the attack while the winger ahead of him moves toward the center of the field. He is strong in his pressing as he has an excellent athletic ability with his size, strength, and speed. He looks to combine out of pressure situations with his teammates and can dribble the ball in tight situations if needed. He likes to receive the ball on switches of play from his central midfielders, so he can run forward and cross into the box for his three strikers. Vida typically plays as a central defender for the team but can fit in at the left fullback role if needed. The manager seems to prefer him over Strinic or Pivaric for this position. He is stable on the ball, he can retain possession of the ball under pressure but won’t be looking to dribble past opponents or play clever combinations. His pass choices are quite simple and safe, and he will run forward in support of Perisic but won’t offer a real offensive creative threat – which is common in the fullback position. He very much looks like a central defender who is playing as a fullback for this team. Lovren and Corluka are quite similar concerning size, strength, and athletic ability. They are both aggressive in stepping out to pressure a player who is receiving the ball to intercept or tackle the ball, while neither have a high speed. They are both strong in the air and in physical duels – which makes Croatia a dangerous team on set pieces. Neither are strong in dribbling situations, but Corluka has shown to have quite accurate passes over a long range. Of the two, Lovren plays the more straightforward passes while Corluka looks for deeper options more frequently. Overall, they are two stable central defenders while neither of them is extraordinary. Subasic has shown to be slightly unstable when attempting to play out of the back. He most often clears the ball whenever he has it and has demonstrated a lack of awareness regarding when strikers are pressuring him. He is quite cautious when it comes to collecting crosses or high balls but has shown an ability to block shots on his goal. Overall, he is a goalkeeper who looks to play longer passes to the strikers or hit a clearance when he has the ball and is stable concerning shot-stopping. 4-4-2(-0) in midfield pressing. Modric with the tendency to drop closer to the midfield line on the far side of the field. While the team has shown it’s capable of playing in a 4-1-2-2-1/4-3-3 shape when pressing, the most common structure out of possession for the team has been a 4-4-2. Modric and the center forward form the front two while the two defensive midfielders and the two wingers form a line of 4 in front of the defensive line. In this formation, the team is generally quite compact while lacking a high intensity in their pressing movements. The two strikers focus on blocking passes into the central midfielders while the opponent central defenders are allowed to circulate the ball until the strikers begin to press on a specific trigger. Therefore, the middle is most often blocked (to an acceptable degree for a national team), and the ball is forced to the wing. On the wings the fullbacks of Croatia press very aggressively and man-oriented. They will follow their winger even if the player is dropping deep in front of central midfield. In this case, the center backs play aggressive and tight marking on the striker when on the near side of the field and are often put into situations where they must pressure and run after the striker down the wing and force them toward the corner flag. The winger runs out to the opponent fullback on the ball and puts light pressure, trying to force a mistake while not tackling or pressing aggressively. The two forwards wait for a pass back from the fullback or central midfielder and then decide based upon the speed of the pass and the distance from the central defender if they will begin sprinting forward to apply pressure. Kramaric and Modric are generally quite intelligent in this process, as they won’t start pressing on merely any pass – they decide to begin pressing when they are confident they will arrive at the central defender within a few seconds of the ball arriving. This allows them to put more intense pressure on the ball and makes it more difficult to be played past – the ball is typically then played to the GK for a clearance. Another trigger is when a pass is played from one fullback to the far side fullback or far side central defender directly. 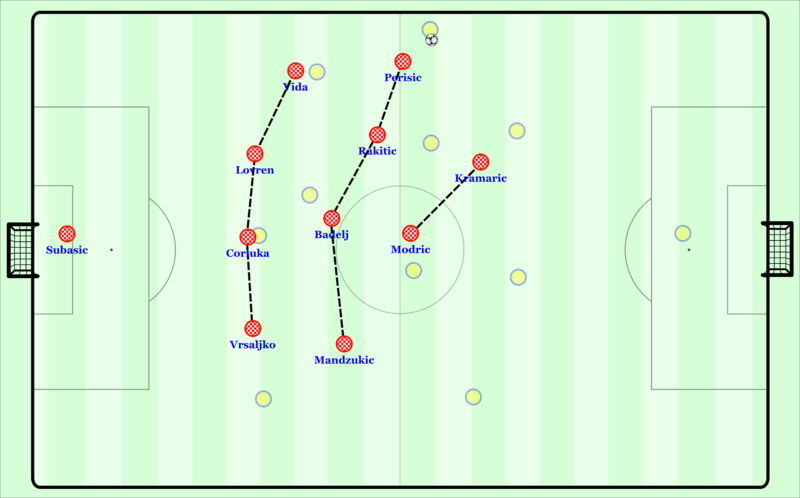 In these cases the far side winger of the Croatian team will sprint straight forward (he is typically in line with the central defender if he is keeping the team’s compactness on the far side) to put pressure on the player by the time the ball arrives at him, this typically forces a back pass to the other central defender or goalkeeper and the two strikers (and the rest of the team behind them) begin running forward to press and force a clearance. Another variation which is commonly seen is when the ball is passed to the wing, the striker on the near side of the field will move higher and closer to the near side central defender of the opponent. This is in an attempt to block a simple back pass, but it often causes trouble for the teammates to cover the near side defensive midfielder. As the striker leaves the defensive midfielder to cut off the central defender (for example, Kramaric), Modric will have to decide between coming a long distance across the field to pressure the open defensive midfielder – which is usually very difficult to do with right timing – and leave the far side defensive midfielder and central defender with more space OR he can stay in his far side position and let the near side central midfielder (for example, Rakitic) step forward on the opposing defensive midfielder. Rakitic stepping forward may leave open a pass into an attacking midfielder in the halfspace behind him, which Badelj and the central defender would have to decide how to cope with. This is a situation when pressing the wing that a 4-4-2 struggles to handle structurally, though it isn’t exposed that often due to general compactness being tight enough to discourage such passes into the center. The ball is typically just played backward and re-circulated. Modric can drop into midfield based upon his decision-making. It is typically when he wants to man-mark an opponent central midfielder who is pushing forward. In these cases, the team can seem more like a 4-1-4-1 or a 4-5-1 but it is only momentary, and when the ball begins re-circulating back to his side, he will pass of his mark to a teammate and step up again into the forward line to block passes into the central midfield. He does this to prevent a possible diagonal pass into the opposite halfspace while giving his central midfielders some extra cover to press by a central midfielder or central defender on the ball. Over the course of the four friendly games, the team steadily improved in 1 crucial detail: central midfielders pressing out to players in the opponent defensive halfspace. For example, if an opponent central midfielder drops out of the 4-4-2 defensive shape of Croatia next to the two strikers – he can typically have some space and time to then bring the ball forward and attack the defensive shape. The strikers are focused on blocking the opponent central defenders, and the wingers are focused on pressing the opponent fullbacks. The dilemma is to move out and press this open player outside of the 4-4-2 to prevent them from calmly bring the ball forward and into the shape to create an attack. In earlier games, the team didn’t press the open player and just looked to remain compact as a block to prevent easy entry into the shape. 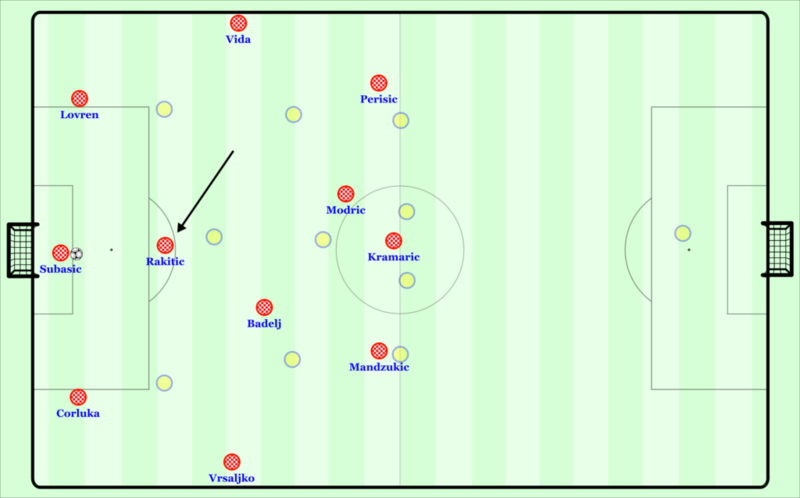 As time went on, and especially in the match vs. Mexico where they used a 4-1-2-2-1/4-3-3 shape, the central midfielders of Croatia began to leave the midfield line and press up next to the strikers while the rest of the midfielders shifted across to compact the shape. In a 4-3-3 this is a bit more intuitive as there is an extra central midfielder and so there is more cover to run out and press next to the single striker – this typically forms shapes resembling a 4-4-2 (in reality, it is more staggered, like a 4-1-3-1-1). After this game using the 4-3-3, the central midfielders began pressing out even in the 4-4-2 shape. So, one of the defensive midfielders would step forward to the player in the defensive halfspace while the far side defensive midfielder and winger tuck inside to close any hole that may have opened in the line of 4. This results in a shape which has three strikers and three more spread out midfielders, resembling a 4-3-3 shape. Ultimately, the team began to apply better pressure in these situations which made the entire defensive shape more stable – making it more difficult for the opponent to find time and space near the defensive block. The speed and intensity of the defensive block are not at a high level as I mentioned, but it is at an acceptable level for international football. Some club teams like Real Madrid even play a 4-4-2 in defense without a considerable intensity or distances covered, but it is enough to remain stable for that phase of the game until the ball is in your possession again. Issues can arise though when the opponent plays a fast switch from one wing to the opposite fullback, and the block is arriving late to put pressure on the ball. If the block is arriving late, the fullback has time and space to play a simple diagonal long pass behind the defense for the strikers to run onto and press or dribble inside toward the middle against the Croatian winger who has a disadvantage in momentum while shifting. When these forms of penetration are not so difficult to achieve, the opponent can create dangerous attacks – it would require from the team a more intense and aggressive movement as a block to reach passes on the outside of the block in time and collectively tackle and pressure and time the ball is trying to enter into the block. Against Brazil, when Neymar was put into the game, Croatia began the struggle because Brazil was more capable of attacking the central spaces than when Neymar was on the bench. When Neymar was on the bench, Coutinho played on the left wing while three defensive midfielders occupied the middle for Brazil. Neymar came on for Fernandinho, and it was Coutinho who moved back to a central midfielder position while Neymar came into the central midfield spaces from the left wing while Marcelo occupied the wing. Suddenly, Brazil was flooding the center with more quality build-up players, and Croatia’s intensity in preventing passes in the middle of the field was exposed. As they reacted to block progression through the center, the wings began to open up for Willian and Marcelo to attack and cross if the attack was stopped through the middle. Most teams won’t be capable of being dangerous in all zones of the field like this, so Croatia should survive without much difficult against a lot of their opponents, but when it comes to games against teams with more quality, this can become an issue. As mentioned above, against Mexico they showed a possible 4-1-2-2-1/4-3-3 variation. In this shape, they had better counterattacks due to having three strikers in high positions once the ball was won as opposed to just having the #10 and #9 in the 4-4-2. With Kovacic or Rakitic winning the ball and dribbling forward, they had three strikers in front of them to play behind and create shots. When pressing in this 4-3-3 variation, the compactness of the team improved as they had all six players in front of the defensive line in central or halfspace positions. This made sure they controlled the center while still being able to shift to the wing quickly to press the ball and prevent progression. This shape was very much focused on winning the ball and counter-attacking. In possession, the central defenders looked to play direct balls to the three strikers to attack Mexico’s defensive line of 3 with dribbles and crosses or combining through the middle with the central midfielders running forward. The idea was not to spend extended time in possession trying to build up attacks, but to be direct when they had the ball and then rely on pressing and counter-attacking to create chances for them. Croatia is capable of playing such a style, it is likely they take this approach against better pressing teams where they don’t want to risk losing the ball in short build-up. It would be interesting to see Croatia take this exact approach in the tournament, though I suspect they chose to play with a front three because they wanted to directly press the three central defenders of Mexico, in every other match they played with the 4-4-2 against two central defenders. Counter-attacks out of the 4-4-2 midfield pressing. Heavily reliant on Modric’s creative ability. As mentioned above, the counter-attacks in Croatia’s typical 4-4-2 aren’t as effective in general due to having four midfielders and two strikers as opposed to having three midfielders and three strikers. The counter-attacks rely heavily on Modric’s dribbling ability. The longer his able to dribble forward successfully, the pressure he attracts and the more time his wingers have to get ahead from deep positions. The counter-attacks from winning possession in midfield typically play out as Modric or one of the central midfielders receiving the ball and playing immediately into depth for the one center forward getting behind the central defenders of the opponent. If the central midfielder can bypass counterpressing via dribbling or combinations, then there is potential to involve the wingers running through the halfspaces. Kramaric usually is the most effective in these situations, while Mandzukic and Kalinic are less likely to expose an opponent defensive with quick movement into depth. Perisic has shown some reluctance to get forward in transition moments while Rebic has proven to be quite useful as a winger in transition phases – it is possible when Croatia want to focus more on counter-attacking that Rebic earns a starting position. Kramaric and Modric certainly can combine through the middle, and when Kovacic is on the field, he can dribble forward with speed. The counter-attacks for this team generally aren’t as dangerous due to the lack of speed in the forward positions, but with the talent, Croatia has in central areas to combine and dribble it’s possible that they can outplay an opponent’s retreating defense to get quality chances. Counter-pressing isn’t an explicit focus of their game. The Croatian team will attempt to press immediately when they lose the ball as an attempt to sustain possession, but it isn’t a focused collective effort with high speed and intensity. The surrounding players will make an initial attempt, and then the team immediately recovers back into a midfield or defensive block to restart pressing in an organized shape. 4-diamond-2 high pressing scheme on goal kicks out of the 4-4-2 structure. High pressing on goal kicks works in the typical 4-1-2-1-2 shape with the two strikers splitting wide toward the strikers and one of the central midfielders pushing forward as a #10 to control the opponent’s #6. The two wingers tuck into the halfspaces while the remaining central midfielder controls the #6-space for the pressing team. Once the ball is passed to one side, the far side striker runs towards the goalkeeper to prevent a back pass while the near side striker presses the near side central defender. The attacking midfielder stays on the opposing defensive midfielder, the defensive midfielders shifts to the near side of the ball and covers the closest central midfielder, and the near side winger press out to the fullback. The far side winger can judge based on the action around the ball which option between the far side opponent central defender, fullback, or central midfielder he should position more closely too to prevent the opponent from escaping the pressure around the ball. In their 4-3-3 shape the center forward simply took the role of the attacking midfielder described above while the two wingers took the role of the two strikers splitting apart. The #8s took the functions of the wingers, and the defensive midfielder kept the same role when comparing to their movements in the 4-4-2 to turn into a 4-1-2-1-2. Build-up structure from goal kicks. Croatia rarely builds out of the back under pressure. This is likely due to Subasic not being comfortable passing under pressure as mentioned above, but also because Croatia has players which are quite strong in the air and so a more direct approach is beneficial to them while not having to take as much risk. The structure results from the two central defenders splitting to the sides of the box and Rakitic dropping out of central midfield in front of the box. Badelj stays higher in midfield on his own while the front four players remain narrower and more prepared for long kicks. The fullbacks push up and maintain width should the goalkeeper potentially look to play to them on the wings directly. Most often Subasic will push everyone up the field and kick directly to the strikers. If there is no real pressure on the build-up players, he will play a short pass into them for them to bring the ball up the field and begin possession in midfield. If he plays the ball short and pressure comes, the players play it back to Subasic for him to clear it up the field. 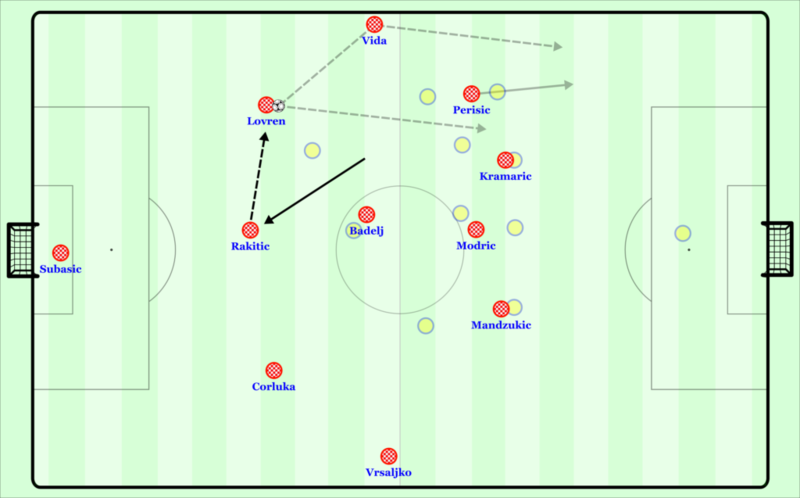 Every team that Croatia had faced in the friendlies building up to the tournament pushed three strikers up onto Rakitic and the two central defenders while having at least three central midfielders spread across the halfspaces to have access to both fullbacks who pushed forward while maintaining a more central position to prevent direct balls through the middle. A 4-diamond-2 is the most common pressing shape on opponent goal-kicks for teams using a back 4. It has high control of the center while the entire team is still capable of shifting to any ball on the flanks, this is all happening while the back four can remain intact and the fullbacks do not have to make long runs down the wings to press the opponents. With Rakitic dropping into the back line, the distances to Badelj are apparent. A 3-1-5-1 type structure is formed. The base formation is a 4-2-3-1. The pre-planned organizational aspect of the system is to let Rakitic move deeper between the two central defenders or to the side of them. This leaves Badelj alone in the center of the field, the central defenders split out wide, and the fullbacks pushed high and on the touchlines. The three forwards remain high and between the lines. Modric as the attacking midfielder is instructed to stay higher and between the lines as well. The goal is ultimately to use this altered build-up structure to find passes into the creative players between the lines (mostly Modric, but if Perisic moves into the halfspace he can be an option too) to then play the strikers behind. Another option is to play to the fullback who can then play the wingers down the line for a cross. Now, from this pre-planned organization by the coach specific issues arise, and the players who have the freedom of decision-making can fix these issues intuitively. Typically, in a more fluid team, 1-3 players move wherever they feel necessary while the rest of the team adjusts their positions to make sure the structure remains balanced. “Balance” in this case simply means being stable for defensive transitions (not exposing oneself by having nobody in defensive positions) and making sure general offensive zones on the field are still filled for circulatory purposes (so if the winger goes to the center, another player should go to the wing, so the team doesn’t have poor spacing by being too compact in possession due to the decisions on 1 player). For Croatia, it is mainly Modric who does this. To an extent, Rakitic and Perisic move outside of the organization more than others as well. When you drop a defensive midfielder out of the center of the field to form a back 3, the second defensive midfielder in the 4-2-3-1 becomes isolated in the center. There are no players in the defensive halfspaces or the #8 spaces around him. There is the back 3, and then the four more attacking players past the opponent midfield line. 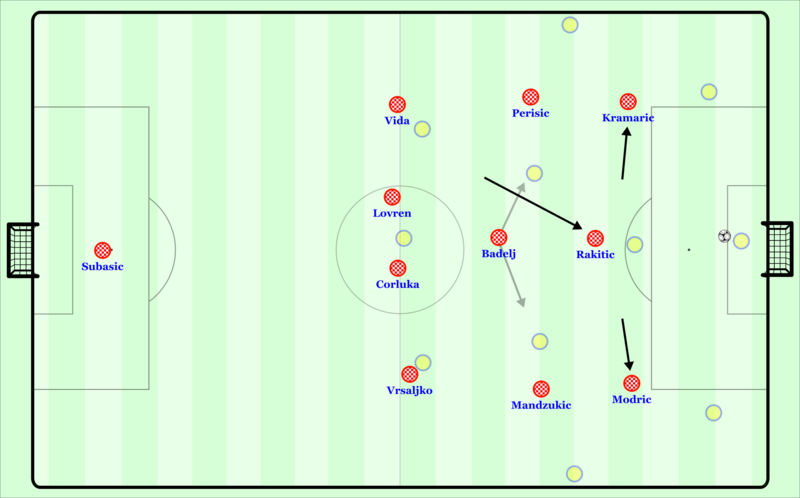 For Croatia, this means that it is difficult to find Badelj in the middle to bring the ball forward to the next line of play because he is isolated (if Modric was in this position, it might be more possible to play into him consistently due to his mobility and press resistance even when isolated by long distances) – the opponent strikers and midfielders can easily deny him knowing there aren’t any other players near him that can move and support him. So, the back line of 3 now has to either find a pass into the four attacking players between the lines (with longer, harder to control passes) or play more straightforward passes out to the fullbacks on the side. The long passes into the forward are of course less stable and result more often in ball losses and counter attacks. The widely split central defenders and unoccupied central midfield make it challenging to stop counter-attacks effectively. If the ball is played to the fullback, he doesn’t have a significant chance of finding Badelj – so the option is to play a sharp diagonal ball into the center forward’s area or to play a more straightforward pass down the wing for the winger to chase and potentially get a cross. Because most fullbacks are less creative in passing or dribbling, their passing tends to be the more obvious choice. So, the ball is forced down the wing, and the opponent can shift there and force the opponent toward the corner flag. The offense ultimately becomes a bit disconnected. There are advantages of doing this – mainly changing the structure of the team to create new passing angles that weren’t there in the first place. This can open more direct passes to the forwards if done correctly. When the structure of a team is changing it is more difficult for the opponent to adjust and block new passing angles. The disadvantages are within the disconnected structure, lessened defensive stability, less control of the center, worse orientation and positioning of the central midfielders once a player drops out of the center, etc. As I mentioned above, Modric is a player who doesn’t stick to the organized plan – instead, he moves based on his intuitive feeling on where there is disconnection or lack of proper circulation and goes there to assist the team in bringing the ball forward. When Croatia drop Rakitic into the back line, Modric will sometimes come deeper into midfield to offer another passing option into the center for the defenders and combine with Badelj to bring the ball forward to the strikers. The presence between the lines is not as significant, but it becomes just as big (if not better, due to momentum) when Modric or Rakitic can dribble or combine past the opponent midfield line and join the strikers to attack through the middle. If the opponent collapses on the interior attack, they play the ball into the wingers or fullbacks to attack the wing and cross. Rarely, Perisic will sense a disconnection and drop into central midfield as well to receive the ball and help bring it forward using his dribbling or a simple switch of play to the fullback. He is the least likely to do it – but he is still quite capable of it. Rakitic can change his role during the game as well. He will frequently alternate his movements. He can decide to occupy a central midfield position and not drop out of midfield, or he can start moving slightly wider in the defensive halfspace rather than falling entirely back into the defensive line. This way he is supporting Badelj more and the two of them can circulate amongst each other to find a way forward with more success-stability. In their match against Peru, Rakitic decided to stay higher in midfield with Brozovic after a period of unsuccessful build-ups. On top of this, Modric dropped back into central midfield as well. Now Croatia was playing with three talented central midfielders in the central zones of the field. This allowed them to have extended possession in the first two lines of build-up while the playmaking central midfielders look to penetrate through the middle or play more direct switches to the opposite flank. The side effect of having improved attacking through the center is that the opponent must become more compact, even if it’s only slightly. Their players field of vision are focused on the center or near side halfspace, while the player on the ball can play diagonal balls to the opposite flank. 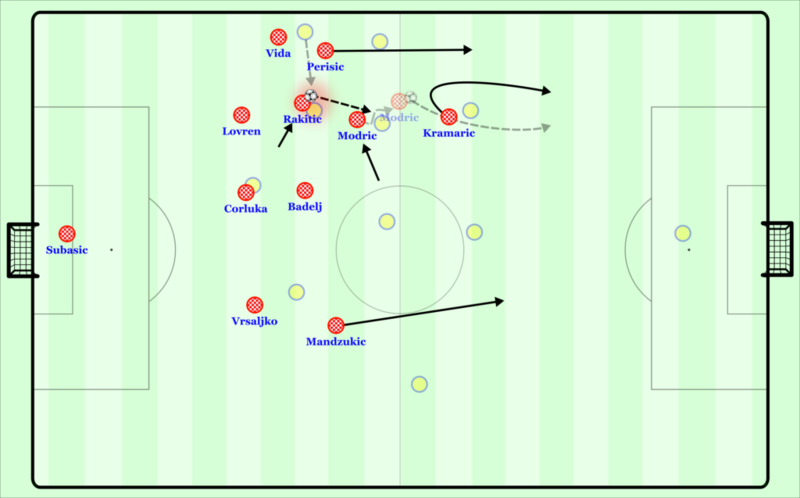 In this case, Croatia had some dangerous attacks with Modric, Rakitic, and Kramaric combining through the center – and as a result, the direct switches from the left halfspace to Vrsaljko overlapping became more available when compared to their more disconnected structure which forced them down one side of the field. Vrsaljko could now better use his offensive ability when attacking a switch of play rather than building down one side of the field without clear central pass options. Croatia began playing more switches and more crosses. With their three forwards attacking these crosses, they were creating quite an efficient form of offense. There were times when all three central midfielders occupied central zones and Perisic moved inside toward the halfspace, and this gave them more stability in central zones…and the positive add-on effects which come with it. It will be interesting to see how this team does. From my experience, I would bet that they don’t make it very far in the tournament. Their counter-attacks are not a consistent weapon from deeper positions in their 4-4-2, they lack real counter-pressing, their possession in midfield has a tendency to be disconnected, and their building up from goal kicks is quite weak. Without the ball, their midfield press is not on the level showcased in the Germany-Spain friendly before the start of the tournament, but it is “good enough” to be stable without the ball – and their higher pressing is well-planned and executed. …That being said, they have impressive individual quality in central zones and a tactical strength when it comes to attacking high balls – whether it be to cross from the fullbacks, set pieces, or more direct balls from the back. Defensively they can get by against most teams, and with the talent of Modric, Rakitic, and Kramaric it’s still possible to create some counter-chances. If the key players perform well and work to cover up some of the team’s weaknesses (and ESPECIALLY if the team uses their 4-3-3 or faces more back 3s), they could become more consistent in building out of the back and circulating in midfield to create chances through the middle or on the wing through crosses. It could turn out to be an impressive display, despite any doubt!